A plumbing problem is never fun and, if caught too late, leads to costly repairs. Luckily, your home's drainage system will drop subtle hints to let you know something is wrong. If you notice any of the following concerns, call a professional to look at the residential plumbing. Indoor Flooding. Usually your home's basement is the first place to look for an indoor flooding issue. While finding the source is simple, understanding the magnitude of the plumbing problem is more difficult. For example, a minor leak can cause current flooding, but if left untouched, it could result in a pipe bursting. Damaged or old appliances also lead to a flood inside your home. Water heaters typically have this issue as they age. If you notice water accumulation around the water heater's base, it's a sign of a damaged tank, pressure relief valve malfunction, or corrosion. Like most home appliances, routine plumbing maintenance is the best way to avoid this issue. Water Buildup Outside. A buildup of surface water around your home can quickly become basement water. The closer these puddles are to your home's foundation, the greater the risk of flooding. If you notice a significant amount of puddles around your home, re-grading the landscape may be the solution. Re-grading redirects water away from your home. If you have a landscaped property with vegetation, it'll also benefit plants. When water pools, it oversaturates the soil, which results in rotted roots and foliage death. Overflowing gutters. Next time it rains, see how well your home's gutter system sends water away from the foundation. Clogged gutters significantly raise the chance of a flood. Regularly cleaning the gutters protects your home's foundation and decreases the amount of pooled water, which easily seep into cracks and cause extensive damage. As the seasons change, it’s more important to check the gutters. Winter is one of the busiest times for a residential drainage system because when snow melts from the roof, the water runs directly into the gutter system. If the gutters are clogged, ice dams form and force the water into your home, potentially rotting the inside of the roof. This perpetuates mold growth in the attic, which can affect the health of your family. Strange Odor. The p-trap is the part of the drain pipe that curves and separates the drain from sewer gases. If the p-trap is dry, an awful sewer smell comes from the drains. To solve this plumbing problem, run the faucet to moisten the p-trap. If you still have sickening smells coming from the drain, the venting pipe could be clogged, causing the same stench. The venting pipe redirects sewer gases from your home by filtering them to the roof to be released. 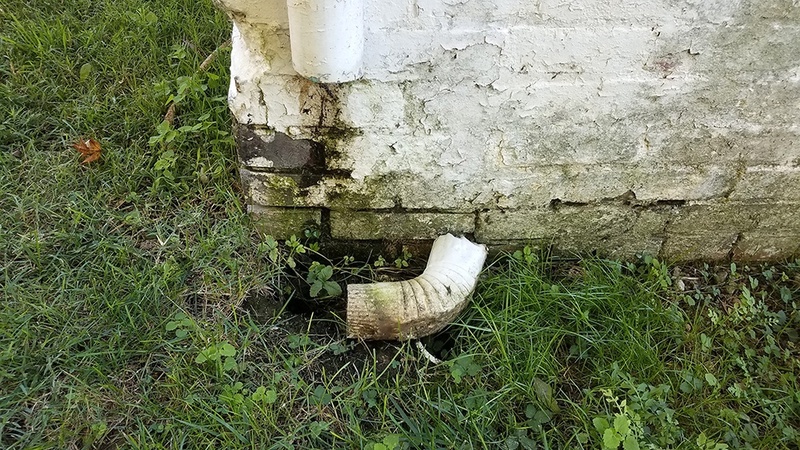 If this pipe is clogged, the gases are trapped in your home. Call a plumbing professional to clear out the pipe. High Water Bill. Nothing is worse than opening a bill that's significantly higher than you were expecting. Some culprits for an increased water bill include a leaky appliance, increased water usage, and a broken water pipe. No matter the cause, getting to the root of the plumbing problem is important to bring the bill back down. While leaks and continuously run appliances are noticeable causes, a clog or break is harder to diagnose. If you don’t spot any obvious signs of inefficient water usage in your home, call a plumbing professional immediately. If you don't, the unidentifiable cause will continue to cause high bills or a significantly worse problem. A buildup of water inside or outside of your home is a frustrating, pricey fix. Take steps to ensure the health of your home's drainage system by maintaining the residential plumbing year-round.